Rep. Maxine Waters (D-Calif.) has no plans to back down when it comes to getting Donald Trump out of the White House. 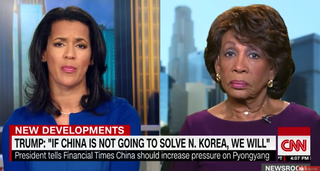 During an interview with CNN’s Fredricka Whitfield, Waters spoke about Trump’s threat regarding North Korea and said she won’t stop fighting Trump until he is impeached. “A lot of people don’t want to talk about that, but I do,” she said.